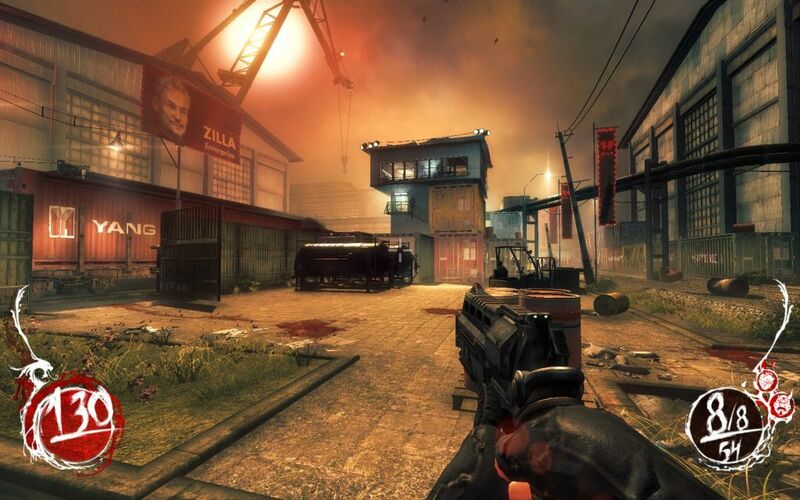 Shadow Warrior is back. I applaud the developers for bringing back the wangtastic humor of the original, even if some racial stereotypes have been toned down for the sake of Political Correctness. The game is fun, especially the interplay between Wang and some ghost called Hoji, who resides in your head and makes sarcastic remarks. The Fortune Cookies too are back and they include some gems. 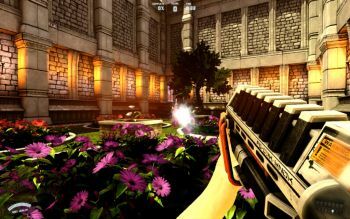 The environments are filled with destructible objects, many of the explodable variety, making it possible to use the environment to your tactical advantage. The game is also less linear than many expected. The developers, Flying Wild Hog, made their debut with Hard Reset, a terrible pseudo-retro shooter (I only played the demo though but even that was too much) with linear corridors everywhere. Shadow Warrior is markedly better with more open map design and even a bit of backtracking every now and then. The game makes a break with nostalgia with its RPG elements - tons of upgrades that augment your abilities, weapons and the trusted sword. Upgrade tokens are pretty scarce and often easy to miss so you really have to make some hard decisions with what you have. Thanks to this and thanks to increasingly difficult opposition, the game has a nice sense of evolution and customization: not only does Wang grow stronger with each upgrade but you get to choose whether to buff your sword or your weapons, your defensive attributes or your offensive powers. There are a zillion ways to kill your foes and mastering those ways is a big part of the fun. There's no automatic health regeneration; instead you gain health by draining it from dead enemies and through the use of various powers, depending on your upgrades. The system felt perfect for the game: I never missed cheap health regeneration or stupid health pickups. Unfortunately, around midway through the game, it stops innovating and becomes stale. At this point you've gotten every weapon in the game and faced every enemy. The developer's solution then is to increase challenge by grouping together more badass enemies while confining the player to increasingly narrow environments. Like all those terrible pseudo-retro shooters such as Serious Sam, Shadow Warrior relies on staged battles where you're locked in some room until you've cleaned it up. As the game drags on, this formula becomes increasingly irritating and dispiriting. Even in Call of Duty you could often step on some invisible trigger to get ahead but here there never is a quick way out. A good chunk of the game then becomes a chore. (The same happened with Alice which too degenerated too quickly into a repetitive formula although here it takes a bit longer.) Luckily there are some pretty good visuals from time to time to keep your spirits up; I only wish they had included some big-city urban environments too. 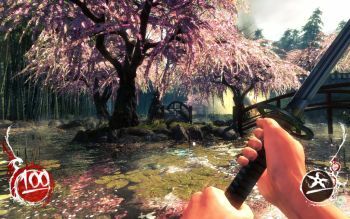 Conclusion: Shadow Warrior is a respectable mix of varied - even tactical beyond simplistic circle-strafing - combat and RPG elements with a bunch of good jokes thrown in. Moreover, it feels like it belongs in the original game's universe while still being far from anything that resembles a cheap remake. Too bad then that the game's biggest problem is that, considering its repetitive, unavoidable staged battles, it's too long (around 10 hours) for its own good. 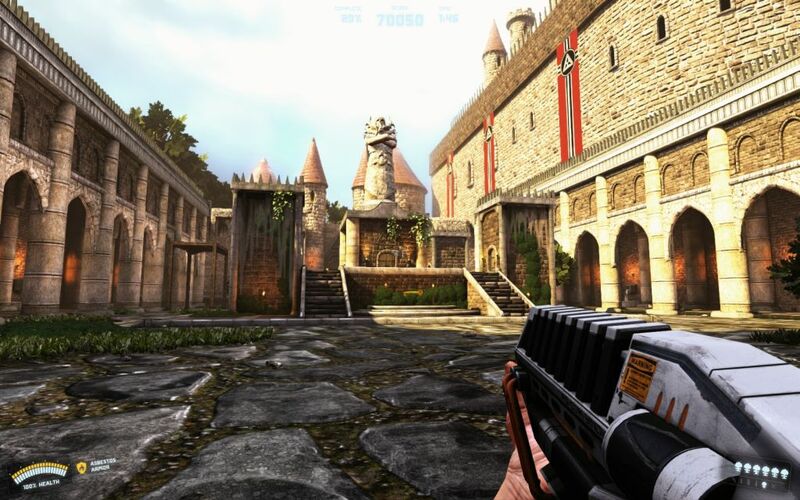 Rise of the Triad (2013) is a remake of a '90s game that only some would consider a classic. 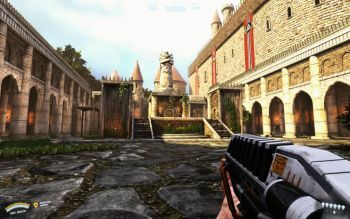 The original had dull, generic map design and tedious combat, leaving it with only a few memorable features: its place was among the cheap Doom clones of the time, not among the likes of Duke3D and Doom. This reboot is about as generic as the original but considerably faster, while successfully sticking to a '90s formula of secret places, superficial story, health pickups and brainless action. The game is very fun when it actually works. The weapons feel effective from the getgo and the various rocket launchers and other more experimental weapons retain their allure all the way to the end. The original soundtrack (which you can choose over the new soundtrack, which I immediately did as I'm allergic to heavy metal) feels right at home in this reboot and the bad guys carry enough variety (if not intelligence), going from a good selection of different nazis to robots and evil monks. At its best the game moves at lightning speed and you're having fun gibbing nazis. Map design doesn't break any new ground and distinguishable themes are lacking but then again its job is to accommodate all the action, not to convey awe-inspiring moments (of which there are a few). There are tons of achievements which are a perfect fit for a game of this type. Unfortunately two factors - platforming and bugs - manage to kill most of the fun. Platforming never was a part of the FPS genre (even Portal realized this), making RotT the odd man out already back in the '90s. There's a lot of platforming in this game, and it's usually of the frustrating variety. It's a bit difficult to get your jumps just right: either they fall short or end up too far; sometimes the jump never even materializes. No wonder then that some parts quickly degenerated into an endless stream of deaths. At least Portal and Alice were quite forgiving whileas in RotT the penalty for failure is just too high. Other types of environmental puzzles are fun for the sake of variety but the over-emphasis on platforming leaves a bitter taste in your mouth. The second problem - the amount of bugs and glitches - is more fundamental. First of all, for an ok-looking Unreal-engine game RotT suffers from severe slowdowns even on medium settings: I'm getting a much better performance out of Battlefield 4 on a mix of medium-high settings. A much bigger problem that cannot really be alleviated by tinkering with settings is the game's half-assed quicksave function. The save function seems to have major problems keeping track of all the variables: upon quickloading, I witnessed reappearing enemies (who had been killed prior to the last save), disappearing vital objects (thus game-killing), non-functioning bosses, disappearing inventory items, etc. What's the point of fetching an armor from a secret place prior to a boss fight if the last checkpoint prior to the battle won't even save it for you (E3M5)? Initially the game didn't even have a quicksave function but relied on checkpoints instead. Considering the amount of instant deaths, I cannot imagine that to have been any better. Probably to avoid even bigger problems, you cannot save during multi-stage boss fights, which got extremely frustrating when playing on hard. (You cannot save on moving platforms either, which is probably a good thing as with the way things are, you'd probably end up at the bottom of a pit upon quickloading). Then there are crashes to desktop, and once it took five minutes for the game to launch. If the game had been released a few days ago, I would understand the presence of some of these bugs, but it's been six months now. As a final insult, the game didn't even give me the achievement for finishing it on hard. Conclusion: The rookie developers had a clear vision of what they wanted and, without the bugs, I wouldn't hesitate to recommend the game. As it is now, however, I cannot recommend the game and it's inexcusable that even today all the severe bugs still persist. You can probably alleviate some of these problems by playing the game on the lower skill settings, which should make at least the boss fights more tolerable, but even that won't fix the platforming segments. Tellingly, the game awarded me an achievement for finishing it in less than 4 hours while my Steam tells me that I spent nearly 8 hours playing it. The difference is the time I spent on replaying certain segments.